Woodrow Wilson in his first posed photograph following his series of strokes. In my podcast this week a listener mentioned that when someone runs for office, he or she loses all semblance of a private life. Their personal business is broadcast for all to see and nothing is kept sacred. One example I used during the episode was FDR's polio and the fact that it was kept a secret to the American public despite the media's knowledge of it. Andrew from California wrote to me after the podcast to say that he agreed that someone in a wheelchair would probably not be elected these days because of the large role that image plays in politics, but he also pointed to two historical examples in which a president's ailments was kept from the American public to the public's detriment. The first actually involved FDR. While he was running for a fourth term, he was in very poor health from decades of stress from his polio. Tests at Bethesda in March of 1944 showed him suffering from numerous ailments, including coronary artery disease and congestive heart disease. So should the electorate been notified of this health report? Some reports out of Yalta portrayed Roosevelt as a sick and weak man who Stalin was able to manipulate to get more favorable terms as World War II was coming to a close. This is called the "sick man at Yalta" theory. If true, it certainly makes an argument for disclosing presidents' health to the public. As Andrew also points out in his email, four presidents before FDR the American public were kept in the dark about the failing health of our nation's leader. Coincidentally, Woodrow Wilson's health issues began during major peace talks during World War I. During the Paris Peace Conference of 1919, Wilson may have suffered from the Spanish Influenza, which in turn may have contributed to Wilson ceding some points of contention to French PM Clemenceau, who wanted to weaken the German state as much as possible as opposed to Wilson's more conciliatory approach and his Fourteen Points. 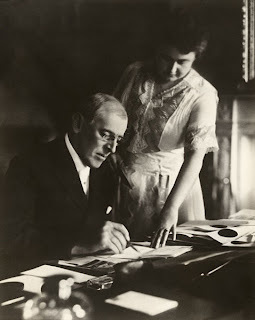 Wilson returned to the States to face further battles with the Senate to ratify the Treaty of Versailles, mainly from the Republican-controlled Senate and Senator Henry Cabot Lodge. During these political battles, Wilson suffered a series of strokes that left him incapacitated, leaving his wife to essentially run the country in his stead. The treaty was rejected by Congress. Now a conspiritorial-minded individual could try to connect dots here and say that Wilson's illness and subsequent inability to ratify the Treaty of Versailles in the US led to a harshly punished, and thus resentful, Germany contributing to the rise of Hitler and the National Socialist party and WWII. You could then further say that FDR's ailments led to an emboldened and stronger Soviet Union, whose post-war maneuverings led to the Cold War. Obviously it would be ridiculous to say that the collective health of Wilson and Roosevelt led to both WWII and the Cold War. But to chalk up their health as non-factors in an historical context would be just as ridiculous. Which brings us back to Andrew's point: does the public have a right to know? In my podcast I didn't take a stance, saying only that politicians open themselves up to this kind of scrutiny when they run for office and this could be a deterrent for some qualified candidates. In my humble opinion, there's a line in what the public should know about politicians running for office. I don't want to elect a president whose heart is failing or who has suffered multiple strokes or has a terminal disease with a negative prognosis, because I have to assume as a voter that their ability to lead will be hamstrung by their disease and its treatments, not to mention the heightened risk of death in such an individual. Additionally, as a constituent, I feel this information is worthy of sharing when it comes to a powerful elected leader. I do not need to know, however, if a president's cholesterol is only slightly high or their prostate is a bit swollen and they have trouble urinating. Like I said, there's a line. But I think that's the problem in today's media. While something like a past stroke ought to be reported on and would be, something like a gland problem that would make the president sweat more than the average individual should not be reported, but still would be. But with the 24 hour news cycle, there is no line that isn't crossed in order to bring in viewers, no matter how capricious the story. So while it would be nice to have responsible reporting on a candidate's health, it simply is not possible thanks to the media's overindulgence in every possible aspect of a candidate's life—no holds barred—to get viewer share.